Interesting fact about Greenland: the landscape is completely different depending on which part of the country you are in. to hiking through the barren craggy peaks and deep fjords of East Greenland. Given that Kalaallit Nunaat (the Greenlandic name for Greenland) is the largest island in the world (technically Australia is a continent), perhaps this should not have come as a surprise to me. But somehow it did. And for this reason I was super-keen to expand my geographical and geological knowledge of my favourite place in the world, and explore part of West Greenland this year. The most famous hike in Greenland is undoubtedly the Arctic Circle Trail (ACT). As the name suggests, this trek basically follows the Arctic Circle (latitude 66° 33′ 39″ N) for 160km from Kangerlussuaq to Sisimiut, allowing you to walk from the Greenland Icefield (the second largest in the world after Antarctica) to the ocean in under 2 weeks. It has made several “Top 10” lists over the past couple of years and the number of people doing it has risen dramatically from around 300 per year a few years ago to over 1500 in 2018. Given my love of remote treks with no people, I figured it was now or never to hike this epic trail. We started out as a group of 4. My friend Tyson, who I’d met on the boat to Antarctica back in 2016 and who had heard me talk non-stop about Greenland for over a year, and Rob and Emilio who I had “met” online in the Lonely Planet forums after my initial efforts to entice my friends to join me failed (Tyson was late to the party). Having spent most of the previous 2 months doing back-to-back long-distance treks in Iceland and East Greenland with Icelandic Mountain Guides, I decided to skip the initial 16km of the hike along the road (I hate walking along roads) and join Rob and Emilio in a transfer out to start of the trail near Kelly Ville. Road to Kelly Ville (top) and the concrete structure (bottom) that marks the start of the Arctic Circle Trail. You can see it heading off into the distance. We’d passed Tyson on the road (we’d offered him a lift but he wanted to walk “from airport to airport”) and I sat down to wait for him as the others started along the trail. Fortunately, he’s a fast walker, and it wasn’t too long before we were also heading out into the Greenlandic wilderness. We nattered away to each other catching up on almost 2 years worth of news, as we followed the trail towards Hundesø lake and it’s unofficial shelter consisting of a caravan with various tacked-on structures. Hmmm… While it may look kinda cool and funky from the outside, the inside challenged even my low standards of cleanliness and, I have to admit, I’d only stay there in an absolute pinch. I’d be much more inclined to camp outside. The first day of hiking along the Arctic Circle Trail is pretty easy going to be honest. It is reasonably flat for the most part with innumerable small lakes (mountain tarns really, with no ingress or egress of water) as the main features. The trail is a foot-width track through Arctic willow, wild blueberries and other low-lying vegetation, and is clearly marked with red semi-circles (a nod to the Greenland flag) painted on stones that are arranged into cairns. Many of these are adorned with discarded reindeer antlers – something that we would see a lot of over the coming days. In fact, the Arctic Circle Trail could easily be renamed the “Reindeer Antler Trail”! The highlight of the day was spotting my first large land animal in Greenland – a reindeer (“tuttu” in Greenlandic)! I’d never seen one before and, given that we don’t have native deer in Australia, it is always a thrill to see these creatures of Christmas carols and Disney stories. Although these guys were quite far away, my hope was that it boded well for future wildlife sightings along the trail. The first official hut of the trail is the small Katiffik shelter at the head of the Amitsorsuaq Lake. We actually stopped about 3km shy of the hut and set up camp beside one of the small lakes that lined the route. I had spent the previous day out at the Russell Glacier and had left Rob and Emilio in charge of buying the camping gas for us all for the duration of the hike. They had bought 4 large canisters (more than enough) but when we actually cracked the plastic seal over the top of the attachment point, they turned out to be “clip-in” canisters rather than “screw-in” canisters. Guess what type of stove we all had?! Fortunately, Emilio had taken a half-full screw-in gas canister from the hostel, which allowed us to have a hot meal at least. However, given that this paltry amount of gas possibly needed to last the 4 of us for several days, we boiled only enough water to re-hydrate our meals and nothing else. Tyson and I lamented our lack of hot tea before bed (a simple and basic luxury while long-distance hiking), and I added filtered water to my porridge so that it could cold-soak overnight. We awoke early to find a note from Lars saying that we now didn’t need to meet at the harbour until 11am. This was because the clients that he was meant to be picking up in Kulusuk were no longer arriving today – so we could relax and enjoy another morning in Tasiilaq. Bonus! He also called by to let us know some special news! 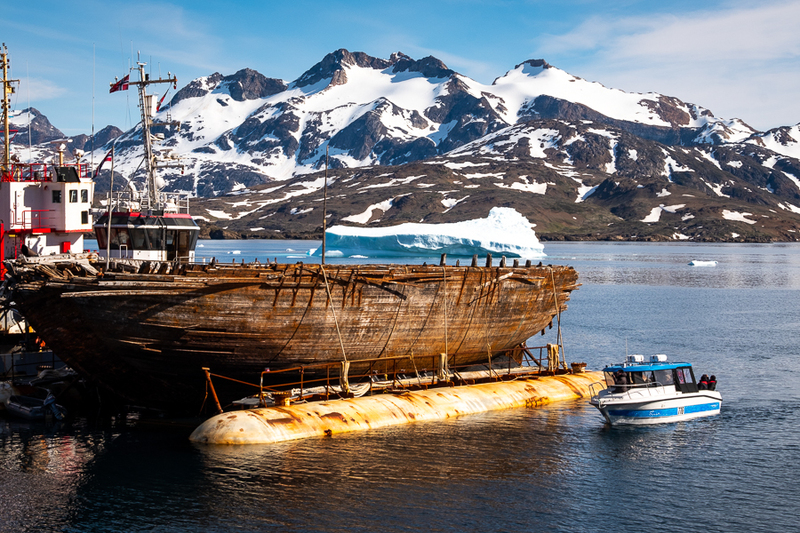 Over the past several years, there has been an extensive project to salvage the sunken wreck of Roald Amundsen’s polar ship “Maud“, and return her to Norway after being stuck in the Northwest Passage for over 80 years. The wreck and the tugboat towing her had arrived in Tasiilaq harbour last night! With their interest in polar exploration, this caused a great flurry of excitement for Eric and Allan in particular and, after breakfast, each of us set out to take a look before meeting at the harbour at 11am. It was yet another bright, sunny morning and it turned out that the best view of Maud was to be had from right in front of the fuel tanks opposite the harbour. There was plenty of interest from the locals as well, who headed out in their own boats to get a closer look at this famous ship. with a model of a boat of course 🙂 set against subtle paintings depicting East Greenland landscapes around the lower reaches of the ceiling. I wasn’t the only one admiring the church at that time of the morning, and I met one of the Norwegian crew of the tugboat making the journey with “Maud”! He was telling me a little about their journey so far and that they were leaving again later in the afternoon for their 6 day voyage to their next stop – Iceland. I wished him a safe trip! Upon leaving the church I still had about an hour before I had to be at the harbour, so I decided to go see if I could see anyone on the sailing boat that I thought was likely to belong to another Instagrammer I was connected to and who was also meant to be in Tasiilaq. “Where was he sailing from?” said with a big British accent. What are the chances that there was a sailboat in Tasiilaq at the time I was expecting, that had come from the UK and that had a Michael on board … but it wasn’t the correct one?! I met the rest of the group at the dock at 11am for our final boat transfer back to Kulusuk. Once again, we had Lars’ new boat, and it was great to finally get to do the trip from Tasiilaq on water (last year I had to change to helicopter transfers due to too much pack ice in the fjords). Although there was very little ice this year, we did have some great views of pretty decent-sized icebergs on the 40 minute trip between the two towns. We had lunch midway between the “airport harbour” (really just a “pull your boat up to the slippery rocks and get out” situation) and the airport on Kulusuk Island, with a great view of some local icebergs. And then it was time to board our Air Iceland Connect plane back to Reykjavik. We had a few minutes of magical views over the mountains and fjords of East Greenland before our plane turned east and headed out over open ocean back to Iceland. Icefjords and Remote Villages by Greenland Adventures is a relaxed and moderately easy trip to East Greenland that is a nice mixture of day hiking and a taste of daily life in this remote corner of the world. If you are accustomed to doing day hikes of 6-7 hours, are prepared for basic (but clean and warm) accommodation, are prepared to chip in and help a little with carrying supplies, fetching water, washing up, and/or helping with the cooking, it is a wonderful experience in this beautiful area. Special thanks also to all my trekking companions who made this trip a ton of fun and who I really enjoyed hanging out with for 10 days. I hope we get to meet again sometime soon! BTW: if you are looking for a more intense trekking experience in East Greenland, I can also recommend the 12-day Unplugged Wilderness Trek that I did last year with the same company. I had actually done this hike last year when I visited Tasiilaq but was happy to join with the group to do it again. Hiking along the lakes in the Flower Valley. They were completely ice-free this time last year! before returning to town and a lunch of reheated frozen pizzas! Lots of brownie points, Andrea 😀 Lots of brownie points! Tupilaks are one of the most common souvenirs in Greenland. The best are made in East Greenland. and then spent several hours wandering around town exploring. All up, a very nice and relaxed day in East Greenland’s largest town. It was another grey morning as we schlepped all our gear out of the hut and back down to the boat from Arctic Dream that was waiting to transfer us from Tiniteqilaaq to the start of the “Sermilik Way”. Plenty of room in here! so I could enjoy the cold  No, actually, so I could take pictures of the very large icebergs we were passing on our way down the Sermilik Fjord. Our drop-off point was on the opposite side of Ammassalik Island to our final destination for the day – Tasiilaq. Lars would continue with our gear and drop it at our accommodation in East Greenland’s largest town (2000 people), while we hiked all the way across the southern part of the Island. The first challenge – getting off the boat! We nosed into some rocks and Eric and Allan clamboured ashore to hold the rocking boat as firmly as possible while the rest of us negotiated the slippery seaweed and the steep but short climb to the start of the hike. and followed the river up towards the pass. and, of course, snow  Lots of snow! It was absolutely stunning! One of my favourite day-hikes in East Greenland to date. Made even more beautiful (I suspect) by the surprisingly large amount of snow still on the ground for this time of year. for an amazing view down to the extremely long Lake 168. Yes, really. That is what the lake is called! We stopped here for “1st-lunch” and I decided to join Rhonda (a keen flora photographer) in taking photos of the lichen and plant life in the area. Greenland has a surprisingly large number of wildflowers, and the variety of lichens is amazing. The other side of the pass turned out to be largely free of snow and very steep. However, we all made it safely to the frozen shore of Lake 168 and went a bit berko taking photos of this incredible scene. we were all starting to wonder whether we’d ever reach the end of it during the second hour of hiking, as we negotiated sand, bogs, streams and, of course, snow. “2nd-lunch” kept us walking, however, and we did eventually pass beyond it. The landscape became less frozen as we made our way closer to Tasiilaq, though there was still plenty of ice in the string of lakes (Lake 101, Lake 100 – no, seriously!) that bordered the route we were following. and our very nice accommodation at one of the houses owned by Lars’ company Arctic Dream. My first shower in 9 days … heaven! Although the fog was still lingering, I decided to set up my camera for time-lapse photography and leave it running while I went back to bed. The result: the following (slightly imperfect) video revealing how the hidden currents in the fjord move the icebergs in different directions (I’ve slowed it down so you can see the movement clearly). The schedule for today had us hiking in the hills behind the hut at Tiniteqilaaq – an excursion that Andrea assured us would reveal views as spectacular as the one from the front porch … if only we could drag ourselves away. and searched for the best way up the mountain, given the numerous snowfields. and the Sermilik Fjord, and of the intricate, almost organic patterns in the Greenlandic rocks (those who have read my other posts from Greenland will know how obsessed I am by the rocks here). and on the other – the Sermilik Fjord. We stopped here for over an hour having lunch and enjoying the perfect day with some of the world’s most spectacular views. Eventually, Andrea encouraged us to our feet for the return journey back to the hut. We initially took a slightly different route which led us past the most incredible snow-pool – an oval of bright blue water surrounded by pristine snow. Despite hating cold water, the pool was so perfect that I had the overwhelming urge to go in! and it was interesting to see what new icebergs had made their way to the front “doorstep” of our hut while we’d been gone. The wonderful thing about time-lapse is how it reveals the extent to which things move, especially when that movement is barely perceptible in real time. For example, I thought that the large iceberg had rotated while I sat there for the hour, but I wasn’t sure. The time-lapse shows just how much it turned before setting off up the fjord, as well as which bergs were stuck fast, grounded on the bottom. After yesterday’s exertions climbing Mt Kuummiut, today was essentially a “rest day” where we transferred from Kuummiut to Tiniteqilaaq (Tinit). There was a low blanket of heavy cloud obscuring the peaks as we traveled up the Ammassalik and Ikasartivaq Fjords, and although I would have loved to have seen the grandeur of the mountains, I also find the mystery of partially-hidden landscapes beautiful and compelling. Given that renovations on the accommodation at Camp Qatoo were not yet complete, we had alternate accommodation just outside of Tinit itself. Apparently it was a bit of a walk up a hill to get there, so the plan was to store most of our gear in town and only carry up what was required for the next 2 nights. This turned out to be an excellent plan, as our new home was indeed more than a kilometre away and up a rocky hill with no path leading to it. But oh my goodness – it was soooooooo worth the effort! The hut had a 270-degree panoramic view of incredible Sermilik Fjord, which held us spellbound as we ate our lunch on the front porch. I have seen a lot of icebergs during my travels here in Greenland as well as in Antarctica and Patagonia, but this ice-choked fjord with its thousands of small and large bergs moving slowly along on hidden currents really was something special. It was almost impossible to drag ourselves away from this stunningly beautiful view but, if we wanted to eat, we had to get to the Pilersuisoq (supermarket) before it closed. Logistics (and stomachs) prevailed in the end, and we all headed back into town charged with various tasks. As there was no running water at the hut (nor a good source of drinking water nearby), Allan and Eric manhandled the water-storage barrel down to one of Tinit’s water pumphouses to fill (we didn’t want to make this trip too many times!). And while Andrea and several of the others headed to the supermarket, I went to raid our own supplies for food for the next 2 days. I ended up arriving back at the hut before everyone else and had an hour on my own sitting in the sunshine listening to water trickle off the icebergs and the occasional sudden crack as one of them disintegrated a little more in the warmth. before returning for more iceberg watching and views over Tiniteqilaaq while drinking endless cups of tea and eating far too many biscuits. Eventually, the cool evening air forced us inside where Andrea had prepared a very tasty stroganoff for dinner. At around 10:30pm, a few of us headed out to watch the Sun set behind the Greenland Icesheet. Unfortunately, our romantic notion was scuppered when the fog rose to obscure practically everything, but it was still a really beautiful post-dinner outing in the silence of East Greenland. Today was to be the most challenging day of hiking for the whole of the Icefjords and Remote Villages trip. The 1050m ascent to the summit of Mt Kuummiut, which towers over the town. Although it was a cloudy morning and the fog seemed to be coming and going over the top of the mountain, it wasn’t raining and we kept our fingers crossed! With this trek, you start climbing almost immediately upon leaving Kuummiut, the steady ascent offering wonderful views back down over the village and the fjord and up to our final destination. As with almost every hike in East Greenland, there is no trail to follow. Andrea led us across mostly rocky ground and slushy snow drifts, choosing her route based on previous experience in leading this trip. A rest stop with an amazing view. Actually, all the rest stops in East Greenland have incredible views! and the ever-present but magnificent Greenlandic rock. Yes, I’m a geology nut! The normal route to the summit is to hike up a valley just before reaching the final steep uphill. However, given the amount of snow we’d already walked through, and the fact that the valley was very firmly held in a snowy grip, Andrea decided to explore a different route up via a ridge line to our left. It was a total winner of an idea! The ridge was quite wide and offered magnificent views that would not have been visible if we’d hiked up the valley. And the going was infinitely easier (and drier) than making our way through deep slushy snow. The final uphill push to the summit was a good workout under bright sunshine (finally), but with plenty of excuses to stop along the way and take photographs. I could even see the Tasiilaq Fjord that we had walked along on Day 8 of Unplugged Wilderness last year. And the view from the summit – a magnificent 360 degree panorama, where photos (even mine 😉 ) cannot do it justice! East Greenland really is a spectacularly beautiful place! and took several quiet moments to marvel at the beauty before us and how incredibly fortunate we were to be here at this time. However, all perfect moments must come to an end and, about an hour later when the clouds started to close in, we began to retrace our steps down the mountain. It was good timing in fact, as only an hour later the fog had started to obscure the top of the mountain once more. The summit of Mt Kuummiut disappearing once again into the fog after we summitted. LOVE Greenlandic rocks! As you’ve probably guessed by now if you’ve read my other posts about this trip, it was time for tea, coffee, hot chocolate and bikkies when we reached the hut. Followed by salad, lamb roast, mashed potato, and chocolate mousse for dinner. Sooooo much food! I knew the good weather couldn’t hold out forever, and Day 4 of the Icefjords and Remote Villages trip in East Greenland turned out to be a very overcast and wet affair. Oh well. The weatherman had warned us! Given the bad weather, Andrea suggested that we “start out and see how far we get”. We could always turn around and come back once we’d had enough. So we donned all our wet weather gear and headed out up the muddy streets of Kuummiut. I find that with the right gear, the thought of hiking in the rain is actually a lot worse than the reality, and after 10 minutes you get used to it. Of course, if you don’t have the right gear, it can be a cold, wet and very miserable experience – see my Day 4 of the Unplugged Wilderness trek last year! Fortunately, I had learned my lesson from that hike and upgraded my gear – so I was warm and blissfully dry despite the fact that we ended up hiking for over 5 hours today! Under better conditions, it is clear that the hike would be absolutely spectacular! But on this occasion, the tops of the mountains were obscured by low cloud and we had to content ourselves with admiring their bases, the soggy ground, numerous streams and wet wildflowers that appeared along our route. About half way along, we stopped for a bit of singing (as you do). Both Eric and Allan shared my love of singing and we had been talking about the Australian classic “The Band Played Waltzing Matilda” (I like John Williamson’s version, even though it was originally written and sung by Eric Bogle). In the end, they asked me to sing it – which I happily did, despite it being one of the saddest songs in the world. Then Allan sang a composition of his own set to the same melody – about being an older person but still wanting to tramp around the world and not be put into a nursing home. It was absolutely brilliant! Very clever indeed. And I think all of us could relate to the sentiment – being out in the middle of nowhere in East Greenland. In the end, Andrea decided not to walk all the way to Illitsiartik. At a large river where we would have had to change out of our hiking boots in order to cross, she instead decided to head up towards the mountain on our left to see what fed this river in front of us. A large waterfall it turns out! and a great place to enjoy a quick, damp lunch 🙂 It would be stunning in nice weather! How miserable do we look? The weather didn’t really improve for our hike back to Kuummiut, but to be honest, it could have been a lot worse. It was just drizzling and wet. At least there was no wind to go with it! Still, it was a relief to be back in the house in the dry and the warmth, sitting around the dining table chatting and drinking tea and hot chocolate. And singing! It seems that Allan and Eric are very keen singers as well as being very keen Backgammon players. They have a particular interest in Arctic expeditions, and sang us a couple of songs about Franklin – one of several explorers who attempted to find the Northwest passage through the Arctic. I loved “The Northwest Passage” sung here by Stan Rogers. Dinner tonight was a thick mushroom soup, followed by spaghetti bolognaise and Koldskål – a strange Danish cold dessert of buttermilk and lemon into which you crush plain biscuits. The Danes actually have a lot of these bizarre desserts! Here’s hoping for better weather tomorrow for our climb to the summit of Mt Kuummiut! More bright sunshine and another relaxed start to Day 3 of the Icefjords and Remote Villages tour in East Greenland. Breakfast at 8am (thankfully, following my late night), have bags packed by 10am, and be waiting down at the harbour by 10:30am for our 10:45am boat transfer to Kuummiut, were our instructions. And one last cinnamon roll from the Pilersuisoq 🙂 Oh my, these things are sooooo tasty and addictive! I’ve have had (at least) one every day since arriving in Kulusuk almost a week ago! The Pilersuisoq supermarkets in East Greenland have the most incredible danishes … in this case – a cinnamon roll. Highly addictive! Down at the harbour, Allan and Eric (outdoor adventurer friends for more than 40 years) pulled out their Backgammon board and embarked on what was to become a very common sight every time we had a spare moment during the trip. At 10:45 on the dot, Lars from Arctic Dream appeared with his new, large passenger boat. He’d only taken delivery of it 3 days ago, and I must stay that it is a big step up in comfort level compared to the boats that transferred us for the Unplugged Wilderness Trek last year! What hadn’t changed was the necessity to help load our gear into the boats to make the journey. Fortunately, given that we would be staying in villages and not camping in the middle of nowhere, this was a much quicker and easier undertaking than last year. Gear loaded, we boarded our transfer and I nabbed a seat out the back in the sunshine. Lars gave us a full briefing of safety on board (another very different experience from last year – if disaster struck in 2017, we were on our own!) and off we set. The views as we headed up the Ammassalik Fjord under bright blue skies were beautiful, though I was missing the spectacle of boating past the icebergs that are usually more prevalent at this time of year. Although the long, cold winter had left plenty of snow still thawing on land, several Piteraqs (fierce storms) in recent weeks had blown most of the ice out of the fjords. It was such a different vista compared to 12 months ago! After about an hour of smooth sailing, the village of Kuummiut came into view ahead of us. Brightly coloured buildings clustered at the base of some impressive looking mountains! Once Jens had tied the boat to the dock, we each scaled the vertical ladder, shouldered our own luggage, grabbed one of the boxes containing our basic food supplies, and headed up the hill to our home for the next 3 nights. Unfortunately, we met with a slight snag at the front door. The key was meant to have been left in a particular location, but neither Andrea nor the local guy who was helping us could find it. So we ended up breaking in! Our standard lunch of bread, cheese and processed meats out of the way, we decided to take advantage of the continuing good weather and go for a short hike up the Kuummiut fjord. When we reached the peninsula Andrea was aiming for, we burrowed down amidst the rocks to hide from the breeze and spent the next hour contemplating the view and watching for whales. Of which there were several! Though all quite far away 🙁 We could see their blows and perhaps a small part of their back, but they were placidly going about their business and not putting on too much of a show for us. We abandoned our whale watching as a weather front came over and the temperature suddenly plummeted. and refill our water bottles as we hiked back to town. This is one of the many beautiful things about hiking in Greenland – the fact that you can drink the water directly out of any stream. One of the (many) awesome things about Greenland is that you can refill your water bottle anywhere. We stopped by the Kuummiut church on the way back to our hut to discover that although it had a more traditional style of stained glass window than in Kulusuk, it also boasted a model boat in the front-left of the chapel. This time an Umiaq – or Greenlandic women’s boat. Then we settled back in our cozy lodging for tea, coffee, afternoon snacks, and fun conversation around the dining table. Dinner was delicious: honey rye bread and brie for starter, salmon, veggies and rice for main, and a weird Danish “strawberry jam” type thing for dessert. and once they’d finished, we stood watching the whales in the fjord from the kitchen window. The great weather continued for Day 2 for the Icefjords and Remote Villages tour in East Greenland, and I was super-excited that I might finally make it to the former DYE-4 radar station! Unfortunately my attempt to hike out there last year failed due to bad weather. While Bluie East Two (which I visited last year on Day 5 of the Unplugged Wilderness Trek) is a left-over from World War II, DYE-4 was part of the Distant Early Warning Line established during the Cold War. And although we’d been told that little of the original installation remained, I was still curious to see it. Plus, its location on a mountain at the southern end of Kulusuk Island promised great views over the Atlantic ocean – weather cooperating! The very cloudy view I had last year on my hike out to DYE-4! After an 8am breakfast where we could choose from toast (yay! I get excited about simple things) with all manner of spreads, muesli, porridge, tea and coffee, we each made a packed lunch for the day from an equally lavish spread of breads, cheese (brie, blue, Havarti), processed meats, tomato and cucumber. You don’t go hungry on an Greenland Adventures trip to East Greenland! We then set off across a partially deconstructed bridge in the bright sunshine. Rather than walking out and back along the (boring) road that runs all the way to the facility, we hiked without a trail towards the West coast of Kulusuk Island. After about 45 minutes, we came to a line of large stones with a gap in the middle, located in a relatively clear patch of ground between two small hills. The remains of a Reindeer Fence. Andrea explained that the Greenlanders would “hunt” the reindeer by chasing them towards the gap in the fence. Their colleagues would hide behind the stone wall and kill the beasts as they ran through unaware. This was clearly an effective strategy as there are no reindeer remaining on Kulusuk Island! We continued our hike to the West, picking our way across boggy ground and snow drifts in turn. I loved the views of the large icebergs and almost invisible horizon line of the ocean ahead of us. Once we reached the coast, we turned South and started skirting around the rocky mountain we’d been following. I loved this part of the hike! Icebergs and ocean to our right, the ever-impressive and interesting Greenlandic rock to our left, and an amazing view back down over the whole lot behind us. and as we climbed the rather steep slope, the views became more and more spectacular. As promised, there was little left of the original radar station at the site – the cold war defenses replaced by modern telecommunications antennas. However we did spy this ptarmigan pair on our way to a very special lunch spot that Andrea had “reserved” for us. I was particularly excited to see these birds as I actually know the word for ptarmigan in Greenlandic (go figure)! Aqisseq is one of the roughly 150 Greenlandic words I currently have in my vocabulary – it is a tough language to learn! before starting our descent past the abandoned foundations of buildings to the road leading back to Kulusuk. To be honest, I’m not a fan of hiking along roads, and this one was no exception (especially since I’d hiked 3/4 of it last year). However, we had a great view of the mountain that stands behind Kulusuk airport, the shape of which has given both the town and the island their name. Kulusuk = “chest of a black guillemot” in Greenlandic, where a guillemot is a black bird. Does this look like the breast of a black bird to you? Last year the lakes on Kulusuk Island were ice free. This year, still semi-frozen! and were rewarded with amazing views over the village of Kulusuk, the fjord and the mountains as we hiked the final kilometres into town. We all sat out on the deck of the Kulusuk hostel basking in the warm sunshine, drinking tea and eating leftover chocolate cake, before being called in for a dinner of prawn cocktail breads, Greenlandic lamb chops and roast veggies, and rice “pancakes” for dessert (we had loads of rice left over from last night’s dinner after all). Sample meal with Greenland Adventures. You won’t go hungry! After dinner and instructions for the next day, everyone headed to bed. However, we’d been told about a live band playing in the local community hall that night starting at 10pm, so I decided to head on over there by myself. I’m so glad I did! The band was made up of local musicians (e.g. the guy who runs the “service house” in Kulusuk was one of the guitar players), and was actually pretty good! There weren’t a lot of people when I first arrived, but within a minute of sitting down, 3 Greenlandic girls who were dressed to the absolute nines in tight black lacy dresses got me up to dance with them. Love these experiences! The music was a mixture of slower songs, rock, and fast country, with the most popular being the fast country. Every time the band launched into one of these songs, all the girls in the room would hit the dance floor, pair up, and spin and turn together in what almost seemed to be a “standard” dance that everyone knew. They were so energetic about it, and there were older women as well as the younger girls flinging themselves around the room. Awesome to watch, and I really, really wanted to join in – it looked like so much fun! At about midnight, the band took a break, and I walked out to the statue of Milka Kuitse to take in the sunset. It was so peaceful and so beautiful, and I was so thankful to be back in Greenland 🙂 Oh how I love this place!